Capturing meaningful insights, metrics, or measurements from real-world systems is hard. Configuring those monitoring alerts to get the right balance is even harder. The goal is to be notified only when something is actually wrong, or about to be broken, and never when there is nothing to do. Even after our industry’s many attempts to solve these problems, most applications expose only the most minimal instrumentation. Most users under-monitor and under-utilize the features of their monitoring systems because the burden of understanding and configuring them is too high. So instead of using these sophisticated tools, businesses tend to focus on the simplest availability metrics and miss out on cost-savings, bottleneck-eliminations, and other optimizations. This results in missed warnings and things catching on fire! I joined the new Rackspace Cloud Intelligence team four months ago to help analyze this abundance of monitoring data. I loved studying machine learning at UC Berkeley, so I was excited to see more real-world applications of a variety of awesome algorithms and statistical techniques. We are deriving knowledge from the user's raw data and existing configurations to produce high-value observations. This stands in contrast to products that present the user with a feature-rich interface that requires deep understanding and in-depth configuration. We're exploring a variety of approaches to the challenges of turning the seemingly meaningless noise of real-world systems into useful, actionable insights. We want to know when and why things go wrong for our users and how to define wrong. This is hard because it requires embodying human judgement in the logic of software. An experienced sysadmin would be able to set up the appropriate thresholds and conditions to monitor the health of his or her specific environment. The primary objective of the Cloud Intelligence team is to expose relevant information, like this sysadmin’s understanding, and to help users resolve issues with their infrastructure. There are lots of ways we could have chosen to approach this problem. We started with two powerful sets of algorithms: anomaly detection and pattern recognition. Each work well, but together they have some promising implications. Putting this combination to work requires careful engineering. Our anomaly detection identifies abnormal spikes, dips, and jumps on the metrics that you have configured in the cloud. An anomaly means more than just going above or below a threshold—we capture abnormal occurrences by understanding what is “normal” for your system. We started with a variation on Bollinger Bands because they’re simple and provide relative definitions of high and low values per time series. Traditionally, Bollinger Bands use the same number of points to calculate the moving average and the moving standard deviation. We’ve found that using a larger span of time for the standard deviation than the moving averages works better. Using a smaller window for the moving average results in a closer fit for the more recent values, which allows the algorithm to be more robust to trends. By using a larger window for the standard deviation, we capture the normal amount of variation on each metric without it dropping to the minimum standard deviation during short periods of constant values. This is a useful statistical approach because users' systems and applications frequently maintain steady states with intermittent periods of activity. We also apply some additional analysis to the output of Bollinger Bands to filter out periodic behavior or otherwise normal behavior. Our pattern recognition algorithm finds similar behaviors across different server instances in your environment. We start by smoothing the time series by mapping to a set of discrete states via first order differencing. This way we get the movements between the points in the time series, which captures change in the metrics regardless of raw magnitude. We determine a causal model for the observations made of your server over time using a belief network that maps the observations to finite state sequences. We then apply a vector similarity approach to a time series of these states to determine which sequences are most similar to one another. This is a pretty common implementation of a similarity function that computes the cosine between two vectors. You can think of this as the angle between them. In this case, the closer the angles are, the more similar the state sequences are. These state sequences capture most of the signal in the metrics, so by comparing these we’re able to get pattern recognition with less noise. Then it becomes a simple sorting exercise to find the ones with the best similarity score. From there, we display the patterns in order of relevance based on the score and how recently the pattern occurred. Making these algorithms useful is about more than statistics and machine learning. The output has to be meaningful and actionable to users for every type of analysis that we provide. This is why we're working hard to provide users with the functionality they need to get meaningful information and actionable insights based on learning their feedback. The methods we use are always evolving in this rapidly changing space, so be sure to keep an eye out for more news soon about Rackspace Cloud Intelligence. Get started today. 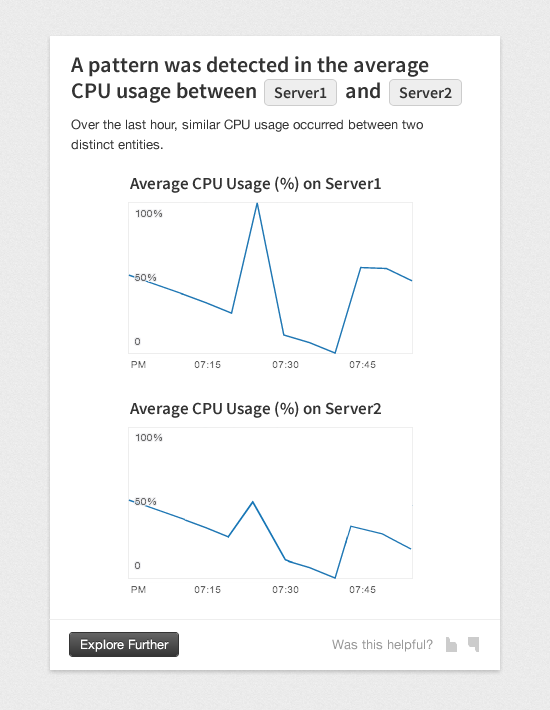 Set up checks in Cloud Monitoring to get more awesome metrics.